Whatever book about rewards you read, its recommendations about designing a reward system will be related to one of the six reward questions. Depending on the book the reward answers will differ. Reward Decision: Most books probably give you a positive answer: Yes, you should reward your employees. However, there are books (or rather academic papers) that tell you not to reward your employees. Reward Target: In any company different types of employees exist: Managers, blue collar workers, white collar workers, line employees, project team members, permanent teams, individual workers, and so on and so forth. You need to know whom to reward. In general, the reward target relates to the question if you should reward all employees of your company or only a certain kind. In team work, the reward target relates to the question if you should reward the team, the team's individuals or both. You will find different recommendations in the literature. Reward Objective: After answering the first and second reward question you need to know what to reward. The employee's results? The employee's performance? The employee's behaviour? Or the employee's skills? Again, you will find different recommendations in the literature. Reward Type: Another point you need to decide is what kind of reward you want to use? Cost intensive incentives such as cash bonuses or rather recognition such as a certificate or an "employee of the month" award? Or maybe both? Reward Extent: Most scholars agree that an incentive needs to be around 10-15% of the employee's salary. Still, there may exist situations when higher or lower incentives are appropriate. Reward Time: Finally you need to know when to reward your employees. Once a year? Once a month? After reaching a milestone? After the project's end? As shown above many possible reward answers do exist. Which reward answer to choose depends on some external and internal reward factors. For instance, a country's tax system might influence the reward decision. Imagine a tax system which does not levy taxes on income additional to the base salary. In this situation a reward system might be quite attractive, simply to save taxes. A country's inflation rate may also influence the reward decision or the reward type. Imagine a country with a strongly varying inflation rate. A cash bonus, agreed about today, might have a completely different value in one year when it is paid out. Hence, a (monetary) reward would be not the best idea. More important than these external reward factors are the internal reward factors. For instance, the individuals' personality affects almost all reward questions. Each employee is an individual and each individual has different preferences about rewards. Some might love a reward which sends the entire project team to a weekend adventure trip. Others might hate to spend the weekend with their colleagues. And some just don't want a variable salary at all, they just wan't a secure and fixed income. So, the reward type is affected. Also the reward target (whom to reward) is affected by the individuals' personality. Loners are just not suitable for team rewards. In contrast, good team workers' motivation might be destroyed if individual rewards are used. The trouble starts, when loners and team workers have to work together, for example to realise a project. Equally important are the task characteristics which affect, for instance, the reward objective (what to reward). The results of employees doing assembly line work are very easy to measure because an excellent benchmark exists: You can easily compare the current results with past results or results of one employee with results of a colleague. Hence, result based rewards are probably a good idea. In contrast, project teams are usually not suitable for result based rewards. A project is always a unique endeavour and hence no exact benchmark exists results could be measured against. Accordingly, performance or skills could be rewarded. There are much more factors influencing the reward answers. Please read the book to learn more about them. 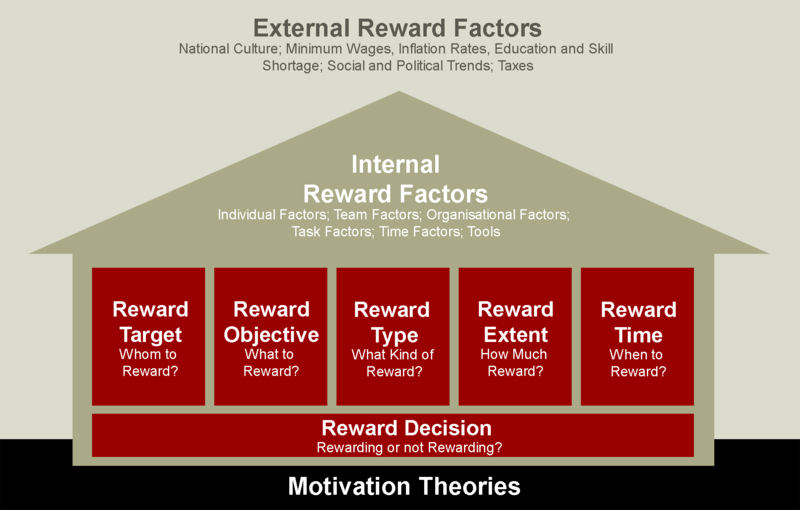 The knowledge of motivation theories is key to understanding rewards. Therefore, motivation theories present the fundament of the Reward House. In the book, 14 motivation theories are explained and their implications for designing a reward system. Motivation theories are closely related with the internal reward factor 'individual's personality'. Motivation theories explain why different people behave different in the same situation. Ggood examples are equity theories. Based on comparison with their own past situation and the situation of colleagues, individuals judge a situation as fair or unfair. Accordingly the same reward system might be perceived as fair by one individual but unfair by another individual even if those two individuals get the same reward and did the same work. To learn more about motivation theories read the book. Please feel free to use The Reward House for your own research paper. The model is available for download in high resolution (16x10cm, 300dpi) and different file formats. You may copy, modify and use the images as long as you reference to this website or the book.